King Otto I was the king who never reigned. His story was a tragic one that to this day remains unique in the history of Bavaria. He became king upon his older brother’s death, but as he had already been declared insane and mentally unfit to rule, his uncle took over his royal duties as prince regent. Otto made no significant contribution to Bavaria and spent most of his time imprisoned in various palaces in and around Munich. Otto Wilhelm Luitpold Adalbert Waldemar was born on April 27, 1848 and was the second son of King Maximilian II Joseph and Marie of Prussia. Most of his childhood was spent with his brother, the future King Ludwig II, and their tutors at Hohenschwangau Castle near Füssen in southern Bavaria. Both were estranged from their parents who spent hardly any time with them and were very strict. Their mother, for example, always made sure that Ludwig wore blue clothing while Otto was made to wear red, despite rarely seeing them. 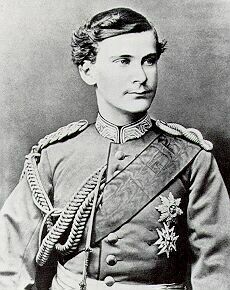 At the age of fifteen, Otto began his brief career in the Bavarian army in 1863 where he was appointed sub-lieutenant on his birthday of the same year. As was typical with royalty, he moved up through the ranks quickly. Less than a full year later, on March 1, 1864, he was admitted to the Cadet Corps and a couple of months later, on May 26, 1864, was promoted to full lieutenant. Otto was then promoted to captain on his eighteenth birthday on April 27, 1866 when he began active military service in the Royal Bavarian Infantry Guards. 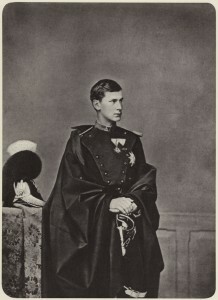 In this role, the Prince participated in both the Austro-Prussian War of 1866 and later as colonel in the fateful Franco-Prussian War of 1870–1871. Otto and Ludwig remained close and performed many of the royal duties together, such as visiting Wartburg Castle in 1867. Although his brother was reclusive and introverted, Otto was outgoing and extroverted until the Franco-Prussian War after which the dark clouds of mental illness began to form. He became depressed and anxious and began to seek solitude, avoiding contact with other people altogether. Reports on his decline were regularly sent to Prussian Chancellor Otto von Bismarck. In 1872 — less than a year after the end of the Franco-Prussian War, Otto was officially declared mentally ill. He would spend the majority of the rest of his life locked away in various palaces. At first, he was moved to the southern pavilion of Nymphenburg Palace in Munich in 1873, then later removed to Schleissheim Palace north of Munich. In 1883, three years before his brother’s displacement and death as well as his own ascension to the throne of Bavaria, he was moved to Fürstenried Palace just south of Munich where he spent the remainder of his life imprisoned. Not only did Otto retreat from all public life, he also had outbursts of strange behavior that were embarrassing for the royal family. The most famous example occurred in 1875, during Corpus Christi Mass in the Frauenkirche in Munich. He ran into the middle of the service wearing hunting clothes and, dropping to his knees, begged the celebrant, Archbishop Gregor von Scherr, for forgiveness for his sins. Churchmen had to lead him away. Dr. Bernhard von Gudden, head of the Munich Asylum, was commissioned to treat Otto. This is the same psychiatrist who, several years later, would diagnose Otto’s brother, Ludwig, as mentally ill without so much as an examination. Dr. von Gudden made no effort to treat the Prince, prescribing several drugs instead to pacify him. Several contemporaries speculated that this treatment was part of a plan by Prussian Chancellor Otto von Bismarck to prevent both Otto and Ludwig from ruling Bavaria. Both were known to be anti-Prussia and to loathe the new German Empire whereas their uncle, Prince (later Prince Regent) Luitpold, and Dr. von Gudden were both pro-Prussia and for the German Empire. Ludwig died on June 13, 1886 and Otto became king of Bavaria. Though he was officially king, his mental state prevented him from performing any of his royal duties and so a regency began with his Uncle Luitpold ruling in his place. In the same year, the senior royal medical officer diagnosed Otto as schizophrenic. 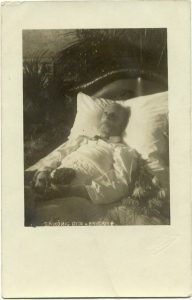 Luitpold remained prince regent until his own death in 1912, when his son, Ludwig — Otto’s cousin, took over the regency. At this time, it was obvious that Otto was never going to be able to reign and many parts of Bavarian society began calling for Ludwig to become king in his own right. On November 4, 1913, the Bavarian constitution was amended by Parliament to include a clause specifying that if a regency lasted for ten years with no reasonable expectation that the king would ever be capable of reigning again, the Parliament and the regent could depose him and the regent could become king. Exactly that happened the next day. Ludwig proclaimed himself King Ludwig III and Parliament confirmed it a day later on November 6, 1913, ending Otto’s kingship. King Otto was, however, allowed to keep his title and honors for the remainder of his life. Otto only lived another three years when he died unexpectedly on October 11, 1916 of a volvulus (an obstruction of the bowel). His remains were buried in the crypt of the Michaelskirche in Munich and, as was Bavarian custom, his heart was placed in a silver urn and sent to the Gnadenkapelle in Altötting with those of his brother, father and grandfather. As the king who never reigned, King Otto I is a figure in Bavarian history that is easily forgotten. He lived in the shadows of those who were kings before him: his father and his brother (arguably the most famous of all Bavarian kings) as well as those who were kings for him: his uncle and his cousin. He never made any significant contribution to Bavarian history and spent most of his years locked away, alone with his demons. This entry was written by Alex Seifert, posted on November 1, 2016 at 10:36 am, filed under 19th Century, 20th Century, Bavarian History, Biographies, Featured, German History, Kings of Bavaria, Multi-Part Series, Royalty and Aristocracy and tagged Otto I. Bookmark the permalink. Follow any comments here with the RSS feed for this post. Post a comment or leave a trackback: Trackback URL.